We have reported about some advancements in Pong before, so I figured we should also report about advancements in ping-pong. Okay, that was a weak introduction, but I believe that Robo-Pong 2040 is the best thing to happen to ping-pong since the paddle. Unlike the automatic servers that tennis players use, the Robo-Pong won’t be running out of balls anytime soon. Once the player hits the balls back, they are collected in a net and put back into the shooter. 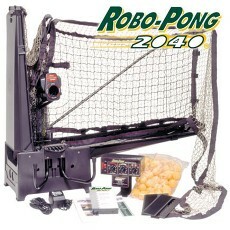 You can purchase the Robo-Pong off the official site or by calling 877-55-ROBOT. It costs about $700, but you can set up an easy payment plan. I have included this video below so you can see it in action. Listen closely to the narration, as it makes it sound like you will finally be able to face an opponent as tough and soulless as the Terminator.